Time Travel and Teleportation will be Possible in 2100? Time travel and teleportation — two things that are used in almost every great science fiction movie. However, most people have accepted the fact that these two concepts will never transition into the non-fiction world of real life. Colin Stuart, the author of “The Big Questions in Science,” is not one of those people. Stuart believes that time travel will be possible in the real world by 2100 — only 85 years from now. Another scientist Dr. Ron Mallett is a world famous theoretical physicist who works at the University of Connecticut, but he was once a child who lost his father very young. Mallett’s father passed away when the boy was only 10 years of age and even then, the thought of traveling back in time in order to try to stop his father’s death riveted his imagination. However, this was not a childhood dream. He studied physics while in college, with a distinctive focus on black holes. He believed that learning about black holes might be able to help him understand more about time travel. At that time, black holes were thought to be something crazy, but they were considered at least reasonably crazy. However, Mallett stated that time travel itself was just considered plainly insane. He added because of that he used studying black holes as a cover-up. Dr. Mallett realized from Einstein’s theories that time was affected by both time and speed. He also knew that light could produce gravity. He then realized he could use lasers for what he wanted to do. 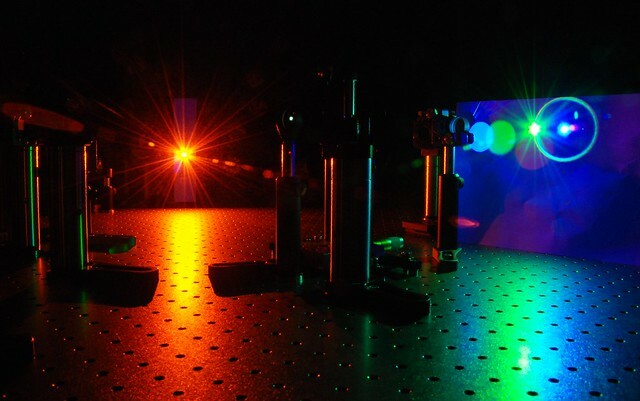 He had worked with lasers many times and knew that a ring laser produced circulating light. He thought that possibly a circulating light would do the same to gravity that a revolving black hole would. If the laser could produce this kind a loop, then formation might be able to be sent into the past in binary formula. A sequence of neutrons could be arranged so that several face up and others are down, signifying 1’s and 0’s respectively. That would make a binary message. Now came the rough part. He would have to test his theory in mathematical equations. He took over six months just to figure out and prove that circulating light could actually twist space. It would be a few more years before he was able to show that the twisting of space also twisted time. Even though it was a long, painstaking effort, Dr. Mallett worked on his experiment until he felt he found what he was looking for. He stated that all the time and effort was worth it. When he got to see the equations and that they predicted time travel was actually possible, it was an amazing thing. His next thrill came when an admired science journal printed his first article about time travel. Now, Physicists from Imperial College London and the University of Glasgow predicted when ‘sci-fi technologies’ as seen in Star Trek, Star Wars, Back to the Future and Harry Potter will probably become scientific fact during the lifetimes of current school children. In research among a panel of top UK scientists and a study of 11-16 year olds commissioned by The Big Bang Fair, scientists said that teleportation could become a daily activity by 2080. Professor Chris Phillips, a physicist at Imperial College London, said: ‘One way to create an “invisibility cloak” is to use adaptive camouflage, which involves taking a film of the background of an object or person and projecting it onto the front to give the illusion of vanishing. Teleportation on a small scale has also been achieved – with electrons. “Teleporting a person, atom by atom, will be very difficult and is of course a physicist’s way, but perhaps developments in chemistry or molecular biology will allow us to do it more quickly,” she said. But promisingly, she added: “The good thing about teleportation is that there is no fundamental law telling us that it cannot be done.”It’s just time travel that’ll be the real tough cookie to crack. Can you imagine being able to teleport yourself from one place to the next without using your imagination? Do you think that it will be possible to travel in time in the real world before the end of the century? Руководствуясь, навязанной нам “эйнштейновской физикой, это невозможно. Доказательством этого являются пирамиды Гизы.